This is my go to Easter dessert. I’ve had friends that have begged for this. Literally begged. And of course, I’m not going to let anyone down if I can help it. The presentation is gorgeous, simple enough and very appealing. I’m not big into cake decorating (I wish I had more talent in that area!) but I can pipe a little star or rosette. I love that with this Lemon Mousse Cake you can get great results, dare I say, professional looking results, even if you’re like me and a bit of a klutz with the piping bag. Lemon Curd Mousse Cake- note that this was cut after the cake was refrigerated. This recipe, originally from Bon Appetit, has a lot of steps, but with a little planning can be easily pulled off. I’m including a lot of notes on a printable pdf here because a couple minutes of reading will save you some time and help you to avoid any potential pitfalls. Don’t let my notes deter you and keep in mind that the Epicurious rating is four out of four forks and 89% would make it again. I’ve made it for years to rave reviews – seriously I don’t know what’s wrong with that other 11 percent, lol! One issue I address in my notes is the curd and how to get it to “behave” and stay in place. A little extra refrigeration makes the difference between the slice above, where the curd all stays put and the slice below, where the curd drips down. Personally, I like it either way. This Lemon Curd Mousse Cake is a showstopper and perfect to make ahead for any Spring Gathering. Make it and people will clamor for the recipe and you might just be a bit embarrassed fending off all the compliments! For a special occasion dessert, this is fairly inexpensive to make. Make sure you have a use for those extra egg yolks or freeze them for another time. Transfer to medium bowl, press plastic wrap onto the surface of the curd and chill until cold. The chilling time will vary, usually four to six hours. May be made a week ahead. Note: Cookies can easily be made into crumbs by placing in a large ziploc bag and crushing with a rolling pin. Using electric mixer, beat egg whites in medium bowl until soft peaks form. Gradually add sugar, beating until whites are thick and glossy. Fold whites into curd mixture in 3 additions. Note: if there is a concern about the raw egg whites, use pasteurized eggs or heat the whites and the sugar over a double boiler, whisking constantly until temperature reaches 160 degrees. immediately remove from heat. Note: I have a set of notes on a printable pdf on the blog post that will really help in making this a success. I will also be bringing this over to Angie’s Link Party, Fiesta Friday # 110, Hosted this week by Jhuls @ The Not So Creative Cook and Apsara @ Eating Well Diary, as well as to to Freedom Fridays, Weekend Potluck, What’s Cooking Wednesdays & Lou Lou Girls’ Fabulous Party. This entry was posted in Click here for Fabulous Food Posts and tagged Bon Appetit, Cake, Desserts, Lemon, lemon curd, lemon mousse, lemon mousse curd cake, mousse. Bookmark the permalink. Oh my! This looks divine. I like lemon, but I’ve always shied away from lemon curd. Your step by step instructions and PDF pointers are perfect. I will keep this close on the horizon. Thanks for sharing! Thank you, Angie! 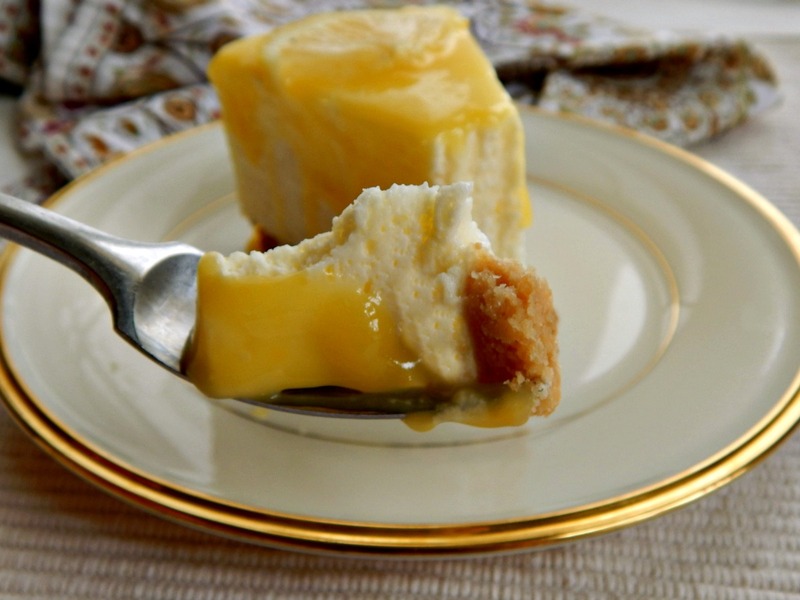 Keep in mind that lemon curd is just like making a stovetop pudding. 🙂 Appreciate you stopping by! hi there, I’m wondering if I add some lemon flavor to the mousse, it would A) be too much of a lemon overload and/or B) make the texture of the mousse too runny. ????? AMAZING looking cake!! It looks very professional, and very elegant. And my mouth is definitely watering now…..
Wow! I am so happy to have this recipe in time for Easter. Oh I’ll have to try this. So pretty and sounds delicious. Definitely pinning this. Thanks for the pin! I appreciate any and all! And yes, it’s a gorgeous dessert – one of my faves! What a beautiful cake! Perfect for a light finish to the meal. Thanks, and it really is a nice ending! Okay, first of all, this is absolutely gorgeous! Your rosettes are piped perfectly. AND…it sounds so sinfully delicious. I adore lemon curd. And on a mousse cake? Over the top! Awesome job! Thanks, it’s really become a favorite of mine! The only problem is that I usually make this for Easter but I wanted to get it out before for my blog, so now we’ll have two this year. 🙂 Wait, maybe that’s not a problem after all, lol! You had me at “creamy, dreamy lemon mousse” 🙂 The rosettes look very cute! Thank you for bringing this dessert to the Fiesta Friday party! It was my pleasure! I love FF and every one I’ve “met” on there! Thanks for hosting! This cake will be in my dreams tonight! It’s so perfect for Easter feasting! That’s exactly how I felt when I first saw it! 🙂 Thanks! AS a professional cake decorator, I can say that becoming a good cake decorator is just a matter or practice, practice, practice. And maybe a cake decorating class or two from your local hobby store, i learned by practicing on Styrofoam blocks. Julie your cake is beautiful as is though. Well, I think talent plays in there, too! I’m so impressed by people like you because it really is an art! And maybe a little magic? 🙂 And thanks! This looks so yummy! Can’t wait to make it! That is absolutely gorgeous and looks perfect for Easter! I wish I could stop by and try a slice. Pinned and yummed until I have the time to give it a try! Thanks so much Carlee! 🙂 You made my day! Oh my gosh this cake looks so creamy and delicious. We love lemon and I’ve pinned it for my want list! Thanks, Julie! I love getting pins! 🙂 I hope you guys will have a chance to give it a try – I’m sure you and John will love it! Wish I could hand you off a slice, lol! And thanks!